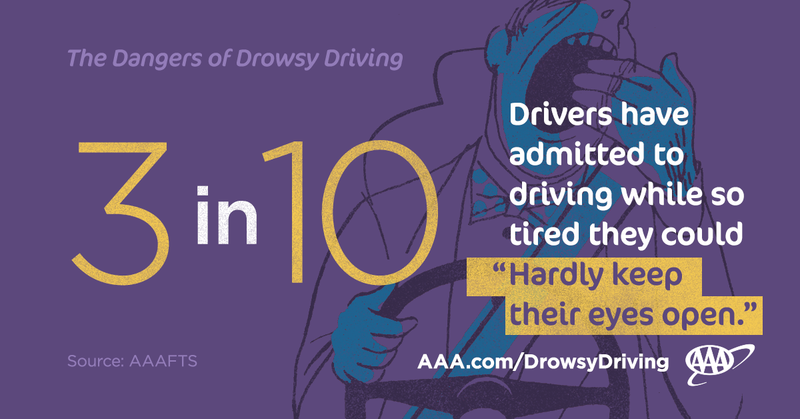 Feb. 8, 2018 – The most in-depth drowsy driving research ever conducted in the U.S. using footage of everyday drivers found that the percentage of crashes involving drowsiness is nearly eight times higher than federal estimates indicate, according to the AAA Foundation for Traffic Safety. The difficulty in detecting drowsiness following a crash makes drowsy driving one of the most underreported traffic safety issues. The new research provides an unprecedented analysis of in-vehicle dashcam video from more than 700 crashes, confirming that the danger of drowsy driving soars above official estimates. In the study, researchers examined video of drivers’ faces in the three minutes leading up to a crash. Using a scientific measure linking the percentage of time a person’s eyes are closed to their level of drowsiness, the researchers determined that 9.5 percent of all crashes and 10.8 percent of crashes resulting in significant property damage involved drowsiness. Federal estimates indicate drowsiness is a factor in only one to two percent of crashes. The Centers for Disease Control and Prevention says that 35 percent of U.S. drivers sleep less than the recommended minimum of seven hours daily. In a recent related AAA Foundation survey, nearly all drivers (96 percent) say they view drowsy driving as a serious threat to their safety and a completely unacceptable behavior. However, 29 percent admitted to driving when they were so tired they had a hard time keeping their eyes open at some point in the past month. 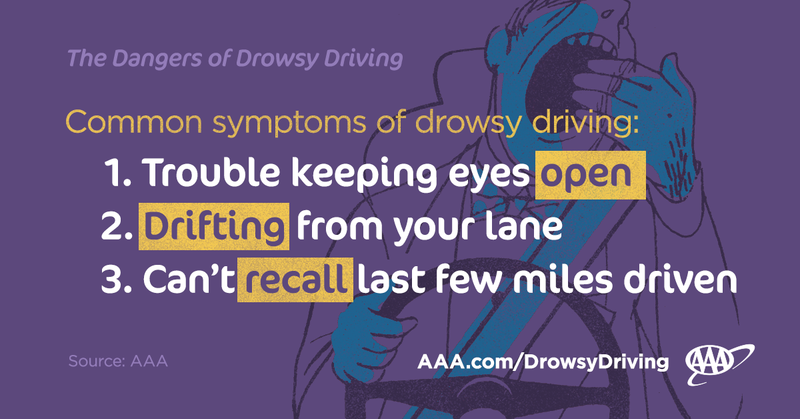 Knowing the warning signs of drowsiness can help drivers avoid dozing off behind the wheel. Drivers however should not rely on their bodies to provide warning signs for drowsiness and should instead prioritize getting at least seven hours of sleep before hitting the road. Do not underestimate the power of a quick nap. Pulling into a rest stop and taking a quick catnap -- at least 20 minutes and no more than 30 minutes of sleep-- can help to keep you alert on the road. To help drivers determine if their medications may cause drowsiness, AAA and the AAA Foundation developed Roadwise Rx (http://roadwiserx.com/), a free and confidential online tool that generates personalized feedback about how the interactions between prescription, over-the-counter medicines and herbal supplements can affect safety behind the wheel. The AAA Foundation for Traffic Safety’s report, Prevalence of Drowsy Driving Crashes: Estimates from a Large-Scale Naturalistic Driving Study, is based on the analysis of in-vehicle video footage of crashes that occurred during the Second Strategic Highway Research Program’s Naturalistic Driving Study (SHRP 2 NDS). The federally funded study recruited 3,593 drivers from six study sites across the U.S. The drivers were monitored continually using in-vehicle video and other data collection equipment while driving their personal vehicles for a period of several months.